Schaefer 4:1 Boom Vang Kit for dinghy's and boats up to about 20'. Boom vangs are important on any sized sailboat. 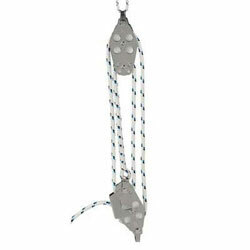 Vangs are primarily used to control the leech of the mainsail by restraining the boom from rising when sailing downwind helping to eliminate excessive sail twist which can make your boat unstable by increasing its tendency to roll in waves. Maximum Capacity: LOA 20', Displacement: 2,000 lbs., Sail Area: 225 sq. ft. Safe Working Load: 900 lbs.